Doctor Channard is sent a new patient, a girl warning of the terrible creatures that have destroyed her family, Cenobites who offer the most intense sensations of pleasure and pain. But Channard has been searching for the doorway to Hell for years, and Kirsty must follow him to save her father and witness the power struggles among the newly damned. You don’t have to believe in Hell to enjoy this movie, but it would help. 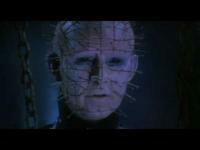 This is the nastiest, goriest, meanest entry in the "Hellraiser" series. Depravity abounds. This one was my favorite. I love seeing movies try to imagine what Hell is really like. Having a belief in the afterlife would definitely make the flick scarier. If you don’t believe in Hell at all, I can see how most of the movie would look a little silly. The Hell effects are not that great. They worked well on me though. Avg. Rating: 2.98/5 stars from 36,076 users.